Magento has pretty neat image helper you can use to output your product photos. Today one of my coworkers got frustrated with the white frame he kept getting around the resized image he tried to output in sidebar block. As s possible solution he tried resolving the issue with CSS. 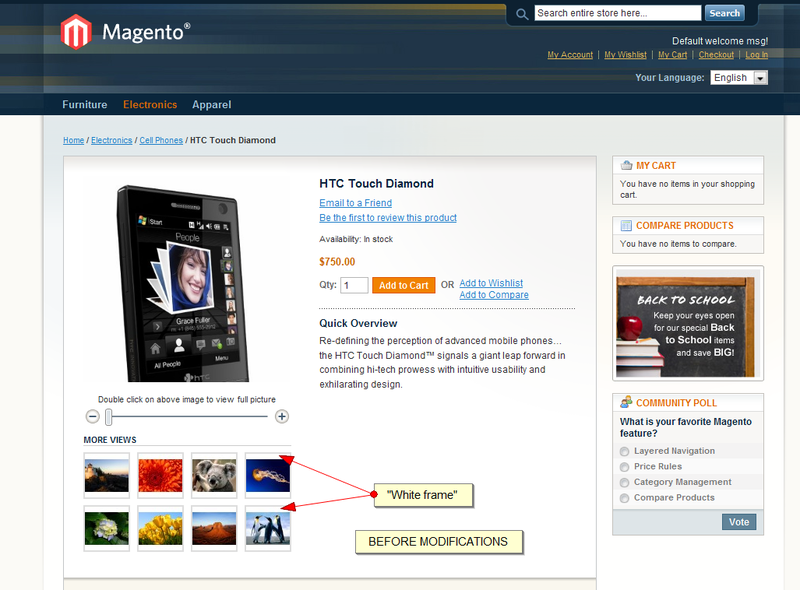 However, there is a better, more nicer solution to ditch the whit frame around resized images in Magento. As you can see, all it took was to add the keepFrame(false) method call prior to calling the resize() method. Here are the results of before/after scenario. Thanks Guys. It worked for me. You guys are wonderful. I tried to change product image width and height but not working. i am using 1.9 version how can i increase the width and height please help me…. There is a Frame Option, where frame images are coming. I first tried the GD2.php to get rid of these nasty borders – but your solution is ways better. Does it also working with .jpg images? Thanks for this Branko, it’s not easy to figure out why the frame is there. But now the image is stretched. found useful.. its working in my magento site…. how can I crop my images to keep the aspect ratio and have all the same size? OK, the image frame I’m referring to is actuall on the featured products block on home page. I noticed I do get them on the product details. This is weird. I actually want a frame on mine and but I don’t see it. I just uploaded a product with an impage and all it shows is the product image and no line frame. I don’t this this as being configurable on the backend. Is there a code I need to look for on the css file? Please help. Finaly got this working after making the changes to the media.phtml file, the border was still there. Edited the styles.css file of my tempate and set the border pixels to 0px instead of 2px and presto no image border or frame. Hi, I am using Magento version 1.4, unfortunately this didn’t work for me 🙁 Any other suggestions? Have also checked the CSS as mentioned above, but there is no padding in any of the classes. 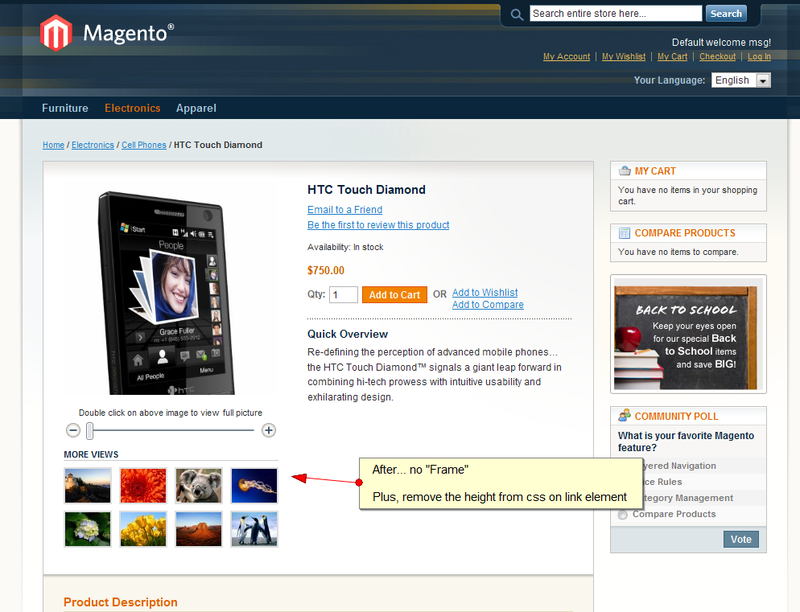 Also removed cached from magento and from browser and no change! Worked for us in Magento Version 1.3.2.4. Thanks! Simply brilliant. That frame is so annoying!! @Guilio Surrounding “a” or shall I say link tag has some CSS attached that adds additional padding to it. Remove the height from “.product-view .product-img-box .more-views li a” from styles.css on line 933 (at least this is so on default theme). Thanks for the great tip? I found the file in this location: /app/design/frontend/default/default/template/catalog/product/view/media.phtml. Edited the file and uploaded it and refreshed my cache, but the images still have the white frame.